rhododendrons, roses etc when they are looking their best! plenty yet to flower so it would be worth visiting in the next couple of weeks. 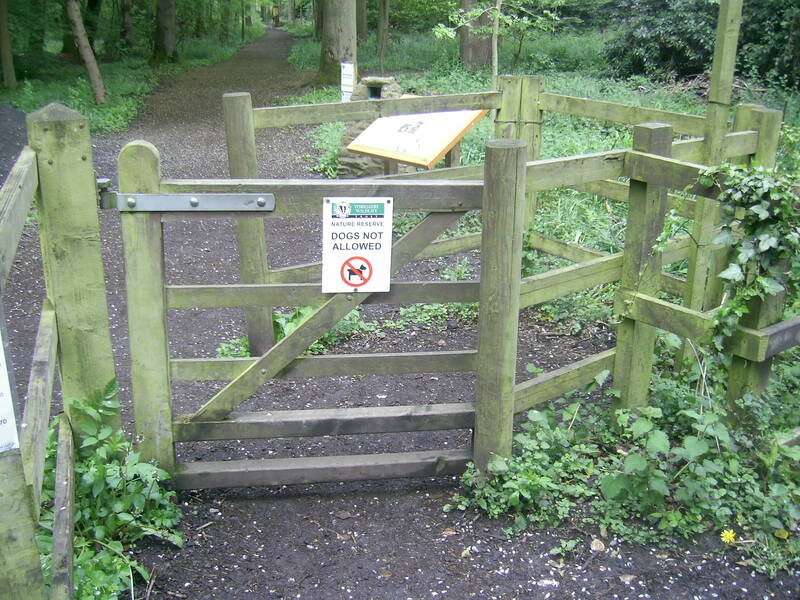 It is managed by the Yorkshire Wildlife Trust and it is not large so makes a good short visit – there is a circular route which takes you past a couple of ponds as well as through the woods and for the able-bodied, there’s a bird hide up some steps. There are plenty of benches and carved posts showing you the wildlife to look out for (we spotted a couple of bunnies!) as well as information boards about the wildlife and the history of the place. The YWT also manage Askham Bog which we visited earlier in the year. In very wet weather I can imagine Moorlands would be very muddy but despite the morning’s rain, when we went it was just damp albeit with a few easily-avoided puddles. The path is mainly just earth: a little uneven in places but nothing drastic, largely flat and with room for passing. The main obstacle is a kissing-gate at the entrance, but I was able to negotiate it on my scooter with a three-point turn. (OK, maybe slightly more than three!) Parking is by the roadside outside the gate – there is space for about a dozen cars and the road is quiet so it was all perfectly easy. 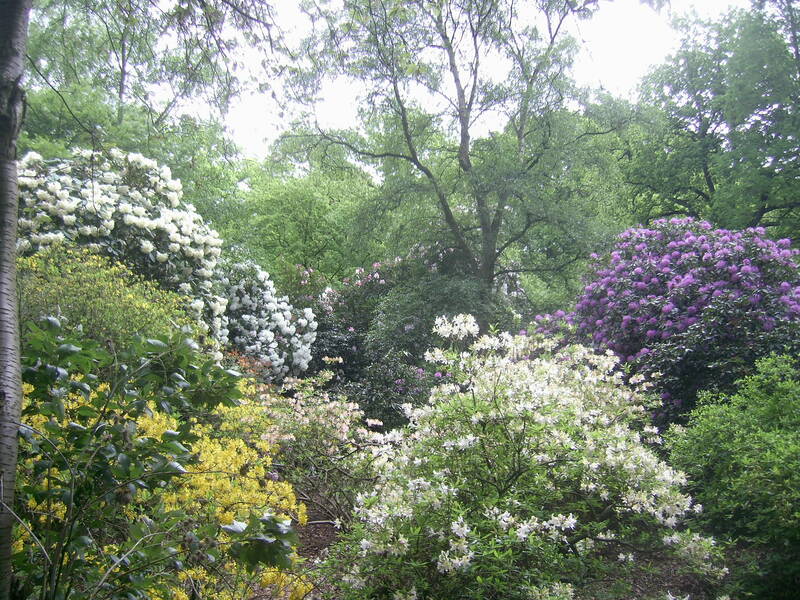 I definitely recommend this for a visit at any time but especially at this time of year – rhododendron time! Possibly the best view in the world! Certainly the best view in Gunnerside, maybe in the whole of Swaledale. If this cottage, the Garth, had been wonderfully accessible I would have been inclined to keep it to myself but as it turned out, it did have its downsides. We booked it through Yorkshire Cottages although you can do it through Owners Direct which has some different and more recent photos. Getting in and out involves a couple of steps, not very deep ones but no handrail and when wet, rather slippery. Inside was so huge (it sleeps 6) I used my trusty Luggie scooter to get around between rooms! The house was designed to make the most of the fabulous views and has huge windows in every room, most of which look over, up or down the dale. There is a shower cabinet as well as a bath but with rather a high step up into it, otherwise everything is fine – they obviously take note of comments in the visitors’ book as new sofas and reading lamps have been added. The décor is somewhat dated (actually, very dated!) but it’s all pretty comfortable and very well-equipped. The first evening in a cottage is always cold in our experience, even though this place has central heating rather than storage heaters. There is a real fire, so we stoked that up then didn’t need it the rest of the time as it was perfectly cosy. 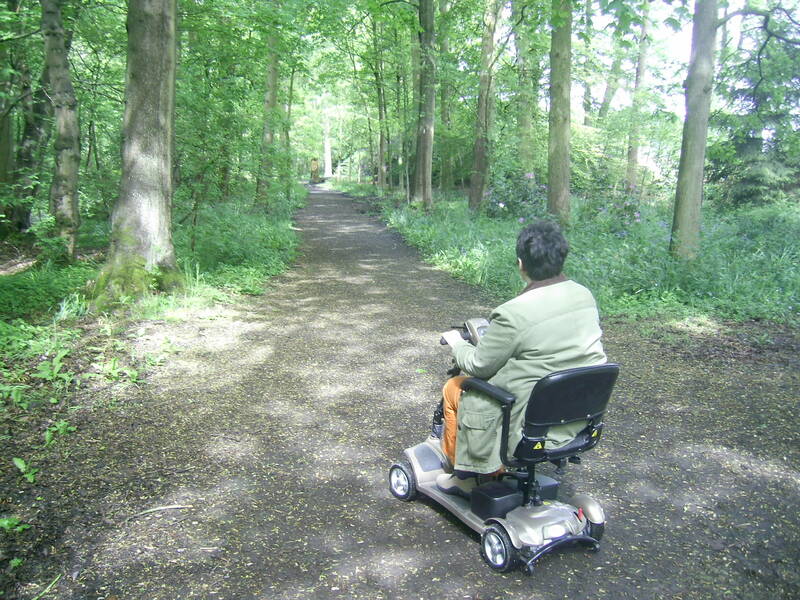 I’m not sure about accessible things to do in the area – we did everything there is to do before access was an issue, so looking at the stunning views is the main thing we do now! Anyone wanting recommendations for things to do or where to buy things, do ask. One of the things we did was the route from Langthwaite to Low Row which takes you through the ‘watersplash’ from the opening shots of ‘All Creatures Great and Small’ – it’s a fabulous route with amazing views. This is a bit tame but something new we tried was the fish and chip van which comes up the dale and stops in Gunnerside on a Friday night – wow, best we’ve had for a long time. Supporting local businesses is always a good thing! There are of course walks galore, including investigating the industrial ruins of the area’s lead-mining past – it is this mix of natural and industrial heritage which makes the dale so attractive in my view. So the quest for an accessible dales cottage continues – I was gutted that this one is not really suitable but new cottages appear all the time, so here’s hoping! I hope you like the posed picture with the bottle of wine – not a bad view from your kitchen! We drove over the amazing Buttertubs pass to get home – no view this time due to the weather but, trust me, it is staggering.